It’s been exactly ten years since we lived in the middle hills of the Himalayas. We still miss it. 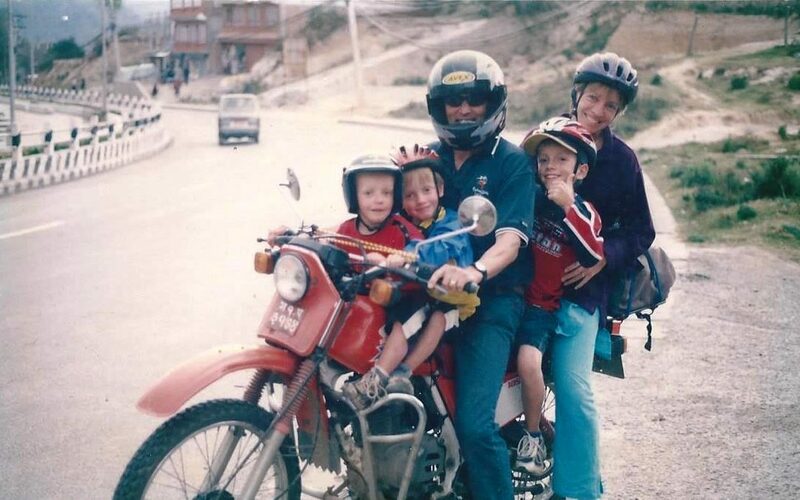 So, to mark the occasion last night, we ate dal bhat together and read chapters 16 and 17 from ‘No Ordinary View’ – reminiscing about our old life on the Dhulikhel ridge, riding around on the motorbike, and doing home-school, and singing in Nepali church, and teaching physio at DMI. In chapters 16 and 17, we also lived through the revolution, and three weeks of daytime curfew, stuck in Kathmandu, away from our home and belongings and friends in Dhulikhel. The embassies were evacuating all their ‘non-essential’ staff and two million people were about to storm the palace, so we got up at 3.30am and raced the curfew, in order to retrieve our belongings from Dhulikhel. We drove through pitch blackness, and piles of burning rubble and debris and broken glass and soldiers trying to enforce the night time curfew. Then we arrived at our home and packed it up in half an hour, between 5.15am and 5.45am, racing around the rooms with pillowcases and shouting goodbye to our terraced back yard… and then we leapt back in the van to be back in Kathmandu before 7.00am, when the riot to end all riots would begin. But we reached the Ring Road and it was quiet. Where were all the people? Then we read the news. Overnight the king had given in, and restored power to the people. The ten year civil war was over. So we ate democracy momos on the roof of the INF flat and celebrated. Thank you for sharing that amazing episode in your life, Naomi. It was more than an episode; it was an indelible memory stamped on the fabric of the life of your family. What bravery! Thanks Lyn, it was good reading the episode ten years later. It somehow seemed even more amazing! And we had quite a few extra questions, like, ‘Why did we do that?” But we also remembered the way we prayed and clung on to God!